West Nottinghamshire College’s apprenticeship arm will be hosting an apprentice open event at one of the UK’s largest Switchgear manufacturers, where people can find out more about vacancies within the company. AF Switchgear Ltd, based in Huthwaite, Sutton-in-Ashfield, is seeking new apprentice recruits in electrical panel building, fabrication and welding and business administration to work at its premises on Nunn Brook Road, NG17 2HU. The event, on Wednesday 27 March, 5.30-7.30pm will enable prospective applicants to talk to college tutors about the apprenticeships, as well as see the factory and office facilities and speak to employees, including apprentices, engineers and administration staff about their roles. “For individuals with an interest in electrical engineering and fabrication and welding or business administration roles this is the perfect opportunity to learn more about these roles within a well-established company which specialises in switchgear and control panel applications. 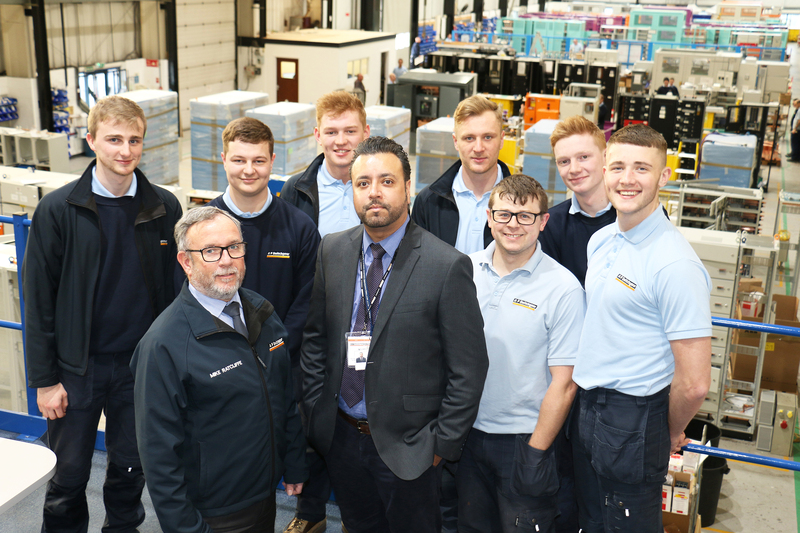 Picture Caption: Mike Ratcliffe and Ricky Singh (front) with current apprentices in the main factory at AF Switchgear.